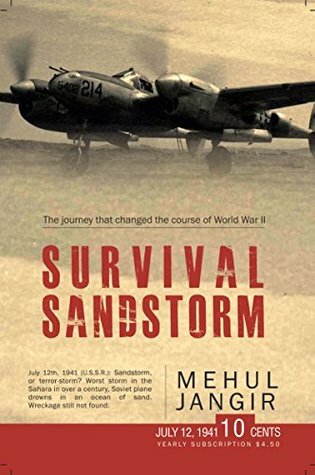 Survival Sandstorm by Mehul Jangir is historical fiction. It is author's debut book, and he wrote it at the age of 12. The plot of the story based on the World War two, and the Sahara desert storm. The book cover goes perfectly with the title. The main character of this story is Ivsker Vodkech, a Soviet pilot in his late 20's or early 30's. He is the youngest fighter pilot in Soviet history and a patriotic. He survives two plane crashes, and now he goes on a next deadliest and most important quest. Ivsker Vodkech with two other Soviet soldiers Nimitz and Jason fly over Sahara desert. They were taking three top most important hostages with them. The hostages have some information which can change the course of World War II. But tragedy hit them, and their aircraft crashes. They were stuck in Sahara with no food, water, or any help. They can't trust anyone because their mission is top secret, and there were spies all over. They ran into enemies trap, and people will pay with their lives. They survive somehow but far away from their destination. This story has some others characters of high authority, and scouts as well. They played a key role. The action sequences and survival skills portray very well. It feels real. The author did the proper research on a topic and is clearly seen in the narration. I read a story Island Games by Caleb J. Boyer. He was also a 12-year-old when he writes it, and I was not impressed by his work. I never thought that a kid can write a historical fiction. But Survival Sandstorm definitely changes my mind about teenage authors. The story is fast paced and short. I like it that way, but now I have to wait for the second part to know more about it. The second book in this series is Survival: Lost. The story tells by different POV's. But it took some time to understand because of chapter name, it was not on the header. The author's writing style is different. I feel a connection with characters miserable and helpless condition. I just don't like the abrupt end. The language is simple. There are minor grammatical and spelling mistakes. Overall, the author did a fantastic job. The story is intriguing and fascinating. It is a recommendable read, especially for historical fiction lovers. Aboard the plane that battles the devilish storm over the great Sahara are three hostages from Nazi Germany, three hostages who can change the course of World War II if they reach their destination. Can Ivsker Vodkech, the best pilot in the Soviet Union, a battle against all odds to deliver the three hostages into Allied hands? Can he uncover the horrific organization operating in Africa? Can he survive?